← Contact isn’t a game, and it isn’t magickal. Learning to ride every stride and make constant adjustments is definitely a challenge. 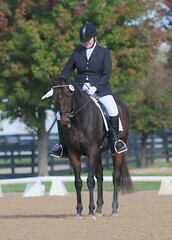 Dressage is truly an exercise in micromanagement. I can tell you that it does get easier as good habits form – you’ll start to automatically respond correctly, and quickly. But forming those habits takes a lot of practiced repetition!